The taste of late summer! 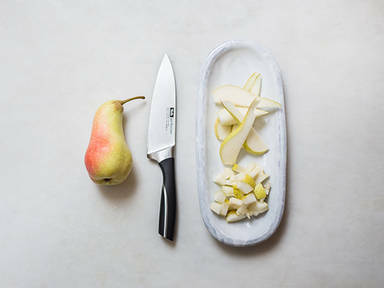 We love pears for their juicy sweetness, their mellow texture, and their versatility in the kitchen. Bartlett and Conférence, the most common species, are known for their sweet, delicate taste. In the video we show you how to cut and deseed a pear. You can use pears in a variety of dishes. They are not only a great topping for cakes, and an essential ingredient for compotes and desserts, but can also be the perfect pairing for many hearty dishes. Caramelized pears with roasted pumpkins make up a great fall salad. In combination with Roquefort or goat cheese, rosemary, honey, and walnuts, they make the perfect topping for a pizza bianca or a tarte flambée. And filled with lingonberries, pears are a classic pairing for game and goose.